On the scenic slopes of Western Ghats, fondly called ‘Sahyadris’ or the benevolent mountains in the state of Maharashtra, the groundnut is attempting a comeback. A new variant, locally referred to as ‘tees taintalis’, could herald its return. 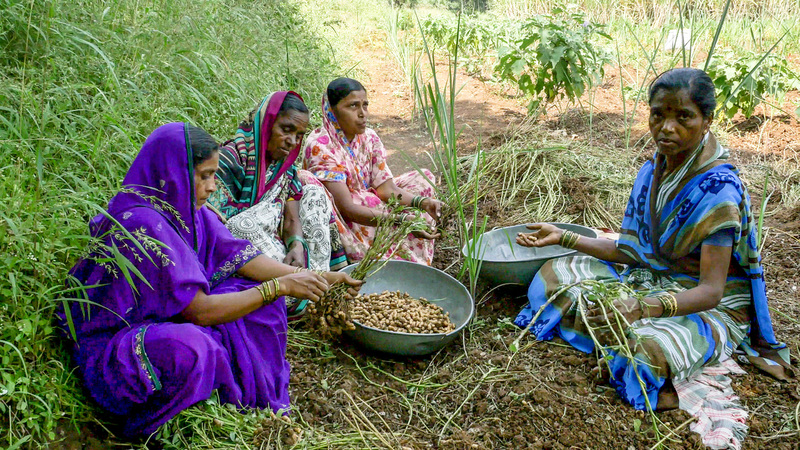 Starting in 2011, the Indian Council of Agricultural Research (ICAR) and ICRISAT set out to breed new oil-rich groundnut varieties by borrowing desirable traits from existing lines. This resulted in ICGV 03043, a variant with 53% oil content, which is higher than other cultivars used in India. The forage of this high-oil variant is protein-rich fodder for livestock as it remains green until harvest. Resistance to leaf spot disease was also bred into tees taintalis, which in English reads ’thirty forty-three’. At his field in the village of Mouje Digraj, a six-hour drive from Mumbai, Mr Tukaram Maruthi Kadam is set to harvest the first crop of tees taintalis. This 38-year-old insurance agent-turned-farmer was cultivating an aging variety before being introduced to the new variant earlier this year. He took to trying it and convinced a few other farmers to join. “The pod numbers in the new variant are significantly higher than in existing varieties. The output could be nearly twice what was harvested previously. I have been approached by other farmers with requests for the seed,” says Mr Kadam. Mr Kadam and other smallholder farmers in Sangli, Satara and Kolhapur districts in the Kolhapur region, do not cultivate groundnut for oil production. Instead, it is grown as an intercrop with sugarcane mainly for local consumption. Groundnut is ready for harvest at the onset of winter before sugarcane tillers turn dense. In addition to seed stashing for next sowing, the produce is sold to the food industry and as seed to farmers across the state. Short duration cropping, ease of cultivation, improvements to soil fertility and high profitability of soybean saw groundnut’s share among oilseeds fall in the 1980s. As a result, in Maharashtra, land under groundnut cultivation as a percentage of total land for oilseeds fell from 22.6% in 1991 to 7.5% in 2011 while that of soybean increased from 7.2% to 75.2% in the same period. Cut to 2016, groundnut production in the Kolhapur region registered a modest 18% increase over the previous year. The trend continued in 2017. 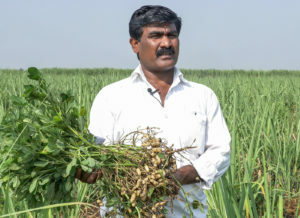 “Early and medium duration groundnut varieties with farmer-desired traits and rising demand from confectionary industry is pushing groundnut’s return in Maharashtra,” says ICRISAT’s Principal Scientist, Dr P Janila. ICGV 03043 was released in 2017 in partnership with Junagadh Agricultural University, Gujarat and ICAR’s Directorate of Groundnut Research. In July, it was distributed among over 200 farmers in Maharashtra for sowing on small land patches as part of a demonstration project supported by OPEC Fund for International Development (OFID). Scientists from ICRISAT and its partner Mahatma Phule Krishi Vidyapeeth (MPKV), an agriculture university in western Maharashtra, assessed crop performance at the time of harvest. Ms Savita Janugade of Janugadewadi village in Satara district told visiting scientists that tees taintalis is easy to harvest, unlike other varieties in use. For women who end up working in drudgery-intensive activities, an easy-to-harvest crop is important to reduce workload. “Harvesting is seen as a woman’s job. Women keep the earnings from the portion of harvest sold as seed. With this variant being easier to pull out and peel, a woman can get her share of money without working too hard for it,” says Ms Janugade, who chairs a self-help group for women. The SHG supports the village’s economy by lending money at low rates. Janugadewadi, where each of the nearly thousand inhabitants share the last name – that of the village, is poised to play a crucial role in the dissemination of tees taintalis seed across Maharashtra. P Deshmukh, Associate Professor, Soybean and Groundnut Plant Breeding, MPKV. With government support, increasing demand, changing climate and farmers’ need for new varieties that can withstand unseasonal rain, groundnut is finding more takers in western Maharashtra. Benevolence of the life-sustaining Sahyadris may just be that ‘one more thing’ the humble goober needs to peg a comeback. For more on ICRISAT’s work in Maharashtra. For more on ICRISAT’s work on groundnut. Participating Institutions: ANGRAU, Telangana; BARI, Dhaka; CCSHAU, Hisar; DAR, Myanmar; DGR, Junagadh; FCRDI, Sri Lanka; FCRI, Egypt; VAAS, Vietnam; Food Crops Institute; IGKV, Raipur; Institute of Biotechnology; Hue University (HU); IRRI; JAU, Junagadh; MPKV, Rahuri; Maize and Cash Crop Research Center, NAFRI, Laos; PJTSAU, Telangana; PAU, Ludhiana; RVSKVV, Gwalior; IOOP, Vietnam; SKNAU, Jobner; SKRAU, Bikaner; TNAU, Coimbatore; UAS-Raichur; and UAS-Dharwad.